Third-party compressors, EQs and reverbs are everywhere, but are they still getting better? Who needs groceries when you can have a new EQ? On the face of it, you're entitled to wonder why there's a market for third-party mixing plugins at all. The vast majority of DAWs now come with a good selection of compressors, EQs, reverbs, etc, as standard, though it seems that, for most computer musicians, these aren't nearly enough. 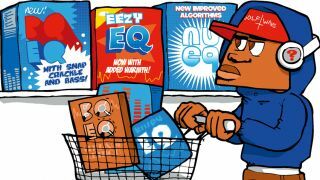 The majority of us are always on the lookout for a new effects processor or two that we think will improve our tunes, and developers are more than happy to provide them. Indeed, some software companies seem to thrive on releasing endless streams of EQs and compressors, but will this state of constant renewal go on forever, or are we approaching a time when the mixing plugin market will reach its peak, both in terms of demand and quality? Let's deal with the most obvious question first: why do users seek out new mixing plugins when they already have them in their DAWs? Dave Gamble is the mastermind at DMGAudio, which has released several highly regarded EQ and dynamics plugins. He thinks it's all about focus. "Plugins are today's 19-inch rack units," he says. "A stock DAW plugin must be simple and effective, like the processing on a desk: not a solution to all problems, but capable enough for most. For the rest, plugins are the way forward." Mateusz Wozniak of PSP Audioware - another company that has made its name producing mixing plugins of distinction - agrees that third-party developers can offer something different to what DAW owners already have. "External plugins can provide a wide range of sound characteristics and GUIs, and they can also emulate vintage gear famous for its sonic personality and ease of use." Wozniak also believes that creators of third- party mixing plugins can afford to be bolder. "Plugins are often - or should be - created with processing quality in mind rather than the lowest possible CPU usage," he notes. Even once we've accepted that third-party mixing plugins do serve a valuable purpose, though, we have to remember that there aren't just a few on offer - there are hundreds. So how do you create one that stands out? "We're a small team with a lot of solid industry experience," explains Dave Gamble. "We know a fair bit about what audio engineers need and how they work. This informs our design work. Also, we have a strong research focus, and we have results and techniques that appear to be unique in the industry." For Mateusz Wozniak, it's all about quality: "We cannot afford to release poor quality plugins," he tells us. "Aside from the quality of the algorithms, our customers know that the plugins we offer are updated in a way that follows their configurations." It's easy to accept that developers are usually seeking to improve on what's already out there, but one thing that customers are entitled to wonder is why so many of them continue to emulate the same vintage hardware again and again. Are the latest recreations actually better than the older ones? "I think that in the beginning, some emulations sounded poor and their strength probably lay in the GUI, which put a smile on a mixer's face," reckons Mateusz Wozniak. "As of now, many emulations are pretty fine and some still need development. Ultimately, the most important thing should not be how faithful the plugin is to the hardware - various revisions of the gear may have performed differently - but how good it sounds in universal terms." Dave Gamble can see why developers and customers keep returning to the classics, but he believes that they should serve as a starting point rather than being the be-all and end-all. "There are plenty of hardware emulations that pass ABX tests and even some that phase- cancel the original hardware," he tells us. "There's something appealing about archiving/ preserving old gear; the units that get modelled are the designs that have stood the test of time, so there's always something to learn from them. This said, over-focusing on the past should be avoided, too - as toolsmiths, we should be designing better tools; copying classic designs is more something with which to hone one's skills." How, then, does a developer approach a new mixing plugin? Obviously, they want to add something to the market, but do they sit down with the intention of creating the ultimate compressor, for example, or do they have to accept that they're inevitably going to be compromised to an extent by the levels of knowledge, resources and processing power that they currently have at their disposal? "The development of an algorithm and the GUI is always based on our current knowledge and experience," explains Wozniak. "We do our best to gain more of both with every new plugin. "Of course, at some point, we also consider if the algorithm could work in real time. In some of our latest projects, we were really close to a level of complexity that would ruin most CPUs; in the end, we figured out how to deal with optimisations without losing quality." Dave Gamble explains the potential reasons behind a new plugin's development: "A design process can be inspired by novel research results that are worthy of implementation, to investigate a concept in user-interaction, or to solve a specific problem. Through debate and consideration, a product vision arises with a succinct summary of the design goal ('an EQ controlled entirely with a graph' or 'a dynamics processor to replace all others', etc). "An advantage of being a small team is that you can ignore your own deadlines and keep pushing until you've fulfilled your design goals. Instead of sitting down to build a new processor, you form an idea of what you want to achieve, then dedicate the resources required, research all the knowledge you need, and optimise to get it running on available processors." The fact that both developers still mention optimisation suggests that there is still some element of compromise involved before a product is finally released. Are we to assume that the already-large mixing plugin market will continue to grow, and that future releases will sound even better than their predecessors? "There are always some limitations," admits Wozniak. "For instance, we still record at low sample rates while we should do it at high ones. There are still some algorithmic areas where CPU usage really is a factor, so we're forced to balance quality and usability. Some algorithms are hard to implement with good results, bearing in mind current processing resources." Is it safe to assume, then, that the best is yet to come? Dave Gamble believes it is: "I don't think improvements in audio processing will ever stop. In this regard, software has surpassed hardware now, so the next few decades will see interesting improvements in software." Stick around, then: as far as mixing goes, the plugin revolution is only just getting started. This article originally appeared in issue 194 of Computer Music magazine.